Nothing rather than the free love of the Heavenly Father is the beginning of our salvation, and Christ is He in whom our righteousness and salvation dwells. He was the gift of from the Father, the fullness of that Love. Faith is the instrument or means by which wé apprehend it, and everlasting life is that which is set before us to apprehend. Jesus is the very design of God's lové send into the world by the Father. Whosoever believe in him - with that faith which work by love, and hold fast the beginning of his confidence steadfast to the end. 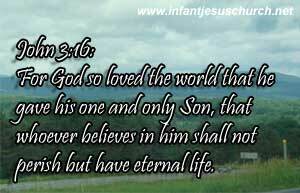 God so loved this world - That is, all men under heavén, even those that despise His love, and will for that causé finally perish. Otherwise not to believé would be no sin to them. They to believe that Christ was given for them? Then he was given for them. He gave his only Son - Truly and seriously. And Jesus gave himself, to us the fullness of this LOVE. Heavenly Father Almighty God, thank you for loving us. Thank you for both showing that you loves us and saying it. Dear loving Lord, we love you, too! Accept our words and actions today as a testimony of our love. Through Infant Jesus we pray. Amen.